I don’t have a ton of experience with Greek food. But I can honestly say that Taverna Tony is the best Greek restaurant that I’ve eaten at, so far. I mean no disrespect to the Greek at the Harbor. You guys are great and make us feel welcome whenever we drop in, but the meal I had the other night absolutely knocked my socks off. Taverna Tony – Just off PCH south of Pepperdine, in Malibu. The location of this restaurant is great. It’s in a cute little shopping center, full of metaphysical bookshops and boutique clothing stores. It’s quintessential Malibu. Plus it’s just across the street from one of my favorite bookstores and the infamous Malibu Starbucks. It’s down a sidestreet though, so it’s not as susceptible to the noise of PCH traffic. It’s also a fairly large restaurant, with a nice little patio for evening dining. The best thing about the restaurant, besides the delicious food, is Tony, himself. I’ve never been to a restaurant which said so much about the character and charisma of one man, like this one did. I got the opportunity to meet the man and find out a little bit about what makes Taverna Tony such a special place. One of the first things that I found out was that much of the decor had been hand-picked and imported directly from Greece. This includes the rustic tables and chairs which give the restaurant and authentic, yet comfortable, feel. Since I was a little late meeting my group of friends, I got there just in time to take advantage of the appetizers they ordered. 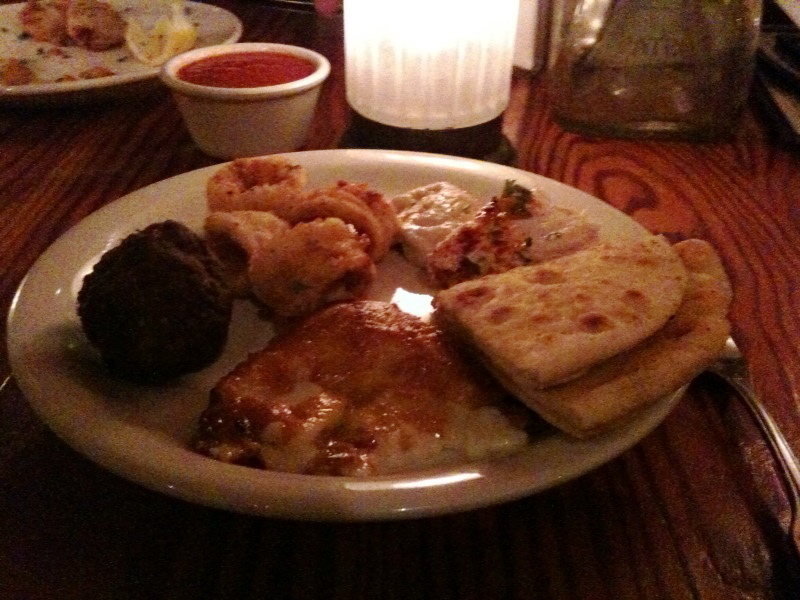 The spread included two dips with pita (taramosalata and hummus), meatballs, fried calamari and saganaki. I apologize for the quality of the pictures. I only had my phone on me and did the best I could. As far as the quality of the appetizers, they were excellent. The fried calamari was crispy and not rubbery in the slightest. It was easily the best that I’ve ever had. The saganaki was amazing, having both a sweet and savory flavor and the perfect “crust” on the flamed cheese. The meatball was moist on the inside but had a nice firm outside and the dips were thick, creamy and exactly what you would expect at a traditional Greek restaurant. I found the dips at the Greek at the Harbor to be just as good, but with slightly better pita. Everything else on the plate had to be called an advantage to Tony’s. I was part of a group of 5 people. Two of them ordered the salmon, two ordered the lamb tenderloin and I ordered the vegetarian plate of spanakopita and tiropita. Everyone got the same sides. Each dish came with roasted potatoes and carrots and a rice pilaf. The roasted potato had a very tasty herb crust and the carrots were soft and succulent. My only complaint, if I had one, was that the rice was a little al dente for my taste. 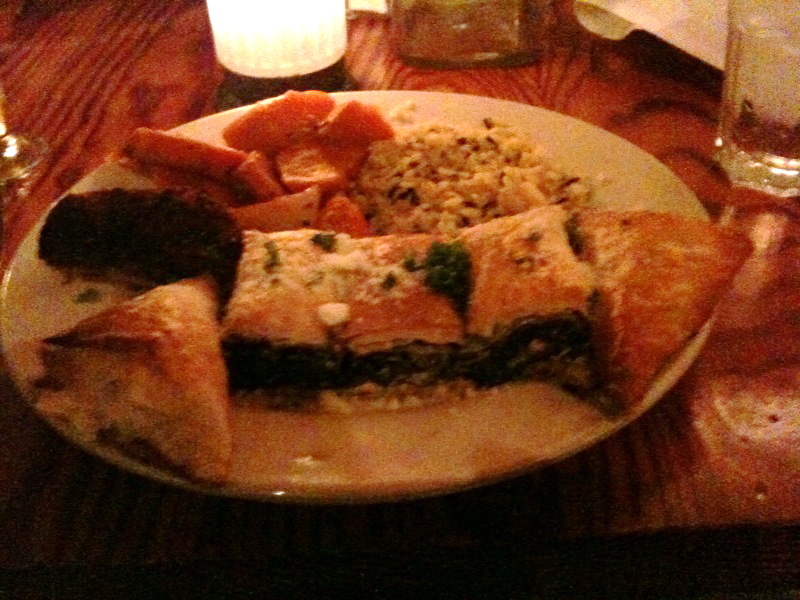 The tiropita was buttery and crisp and the spanakopita was stuffed to the brim with spinach. My taste of my friend’s lamb revealed a filet mignon-like tenderness and flavor. Honestly, if I didn’t know it was lamb, I never would have guessed. The quantity of food was more than adequate, and I ended up taking home two full slices of my spanakopita and leaving the majority of my sides behind. One of the main reasons for this was the fact that I wanted to try their baklava. Tony was also kind enough to bring out some rice pudding, ice cream and fresh watermelon for us to share. We also got the chance to sample their after-dinner drinks, including greek coffee with turkish delight, ouzo and sambuca. The baklava was gigantic and rich. After about two bites, I gave up trying to eat anymore and quickly had the waitress load the leftovers into a container for me, before anyone else had the chance to steal it. Overall, it was a fantastic meal with great company and amazing food. I left Taverna Tony fat and happy and grateful for all the hard work and passion that one man has devoted to the restaurant which bears his name. i heart taverna tony!!! it’s a good place to spot celebs too. Thanks again for meeting us, Im glad you enjoyed the food & atmosphere… Next time we will have to get the day right so we can admire the belly dancers that get the party going, wooooopaaaahhhhhhh ! Spanokopita, tiropita, baklava….enough said. I gotta find a good Greek place here in AZ!